Welcome to our site! Give me a chance to endeavor to catch what makes Jaipuriar School Sanpada extraordinary among a variety of engaging autonomous schools in Navi Mumbai. The Jaipuriar School experience — learning, growing, making friends — will change your life. You will be set up here for the rigors of school and will turn out to be progressively prepared to consider your employment and conceivable vocations. You will partake in the delight of being an individual from an affectionate network and take in the significance of serving others. Our people group is assorted. Focused on making a differently assorted network of students and instructors, Jaipuriar School has an understudy body that mirrors the ethnic, racial, financial, and religious decent variety of the city it calls home. Jaipuriar School's responsibility to this various network and its prosperity is upheld by the educational programs, directing, additional curricular exercises, and Community Time projects and speakers. It ventures into each edge of school life. Our educators are exceptionally capable and devoted. More than twenty of them have doctorates and more than 100 others hold graduate degrees from particular schools and colleges around India. Enlisted for their remarkable scholarly accomplishments and their responsibility to Jaipuriar School center instructive qualities, educators are urged to choose, develop, change, and even concoct their educational module, encouraging an unparalleled feeling of proprietorship and inventiveness in the homeroom. This inventiveness is upheld by a novel and blessed by the gods program of personnel improvement and enhancement awards. The core of the Jaipuriar School experience is the connection between rousing, mindful instructors and gifted, propelled, and drew in understudies. At Jaipuriar School, "the life of the brain" isn't a platitude; it is a lived reality: understudies here are charged by the intensity of thoughts, made accessible in drawing in discussions with instructors energetic about thoughts that shape, characterize, and change the world. In their homerooms and labs and get together corridors, Jaipuriar School understudies seek after a thorough and testing course of scholastic examination that sets them up for accomplishment in the most focused schools and colleges. Jaipuriar School understudies are locked in, dynamic, and glad members in their own instructions. Past the study hall, Jaipuriar School shows its understudies to be dependable and minding, both inside the school, and as natives of the city, country, and world. One spot this happens is in our week after week Chapel administrations. While established in Jaipuriar School's episcopalian legacy, our house of prayer program mirrors the religious and philosophical decent variety of every one of our understudies, and urges them to consider addresses that have for some time been of focal significance to human life: Who am I? What is the idea of the universe? By what method should people endeavor together to have a decent existence? How do the religious and philosophical customs of the world ask and propose answers to these inquiries? Since understudies sit through, yet in addition plan and take an interest in the week after week house of prayer as perusers, artists, and speakers, the administration turns into a sounding board for imperative issues in the lives of the understudies, the school, and the world outside Jaipuriar School's dividers. While Jaipuriar School is best known for its scholarly essentialness, we guarantee quite a lot more: a fair instructive program for body and psyche, essence, fusing expressions of the human experience, games, and network administration; a house of prayer program that calls understudies not exclusively to develop into their best selves, yet additionally to connect past themselves to address needs and substances more prominent than themselves; a grasping and enabling feeling of network that discovers quality in decent variety, solidarity in its mutual promise to mind and understanding, which means in its works, and euphoria in its play. Peruse our main goal; our desires are daring. Peruse our Strategic Plan: our fantasies are brave. Suitably, one of the manners in which the School honored its three hundredth commemoration was by making a mosaic, and I've found that, in significant ways, Trinity is maybe best comprehended as a mosaic: an astonishing array of different people orchestrated by a managing vision (see the School's convincing statement of purpose) to turn into a flourishing network in which the entire is much more prominent than the aggregate of its bright parts. In the not so distant future, I trust you'll go along with me in my voyage to adapt precisely how, every day, our understudies and instructors are cooperating to create a radiantly unique mosaic of human perfection in our study halls, on our stages, on our playing fields, in our sanctuaries, We invite you to get to know the heart of this remarkable community: our students and teachers. Take a closer look. Please enjoy our website and visit the Admissions page to learn more about Jaipuriar School. Please Come and visit us. 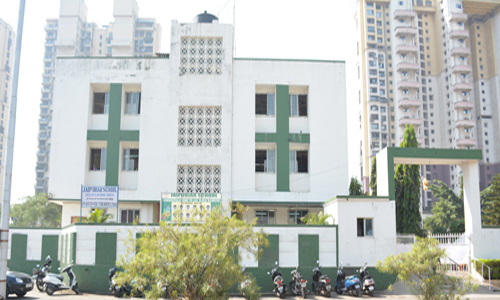 JAIPURIAR SCHOOL, Sanpada, Navi Mumbai established in the year 2001 is a CBSE Affiliated Co-educational institution which caters to students from nursery to Senior Secondary (10 + 2). It has emerged as a reputed institution focusing on continuous improvement of its infrastructure, quality education and overall growth of students. JAIPURIAR SCHOOL, Sanpada Navi Mumbai established in the year 2001 is a CBSE Affiliated Co-educational institution which caters to students from Nursery to Senior Secondary . A happening is performance or situation meant to be considered art, usually as performance art.